WASHINGTON, DC – Democrats up and down the ticket are seeing increased online contributions during this election cycle, powered in part by network effects that are providing them with improved conversion rates, due to the prevalence of NGP VAN, the leading tools provider to Democratic and progressive campaigns. Thousands of Democratic candidates and committees are clients of NGP VAN, ranging from Ready For Hillary, to the Democratic Senatorial Campaign Committee, to over 80% of the Democrats in the U.S. House, to thousands of other Democratic state legislative and smaller campaigns. For example: Democratic House candidates have raised on average 34% more online in the 2014 cycle than they did in the 2012 cycle, according to an exclusive NGP VAN analysis (see more below). This trend is expected to gather steam, since smaller dollar contributions increase as the election gets closer. NGP VAN clients are benefitting from innovative features that take advantage of the network effect of being an NGP VAN customer. 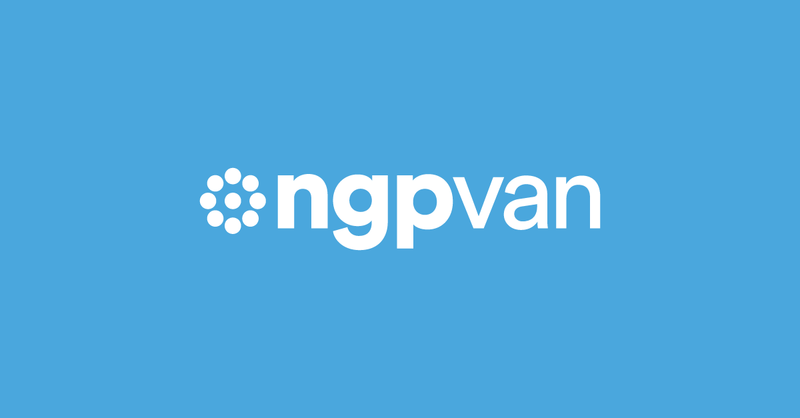 Over 50% of the online forms of NGP VAN customers are prefilled in whole or part, leading to higher conversion rates, as supporters can avoid tedious re-entering of information into online forms. Similar to the Obama campaign’s “Quick Donate” feature, NGP VAN FastAction and Action Profile features allows supporters to contribute to Democratic campaigns without having to filling in the form fields on a contribution page. This is accomplished by securely saving their information in a unique customer profile. Unlike the Obama feature, which only worked on the Obama campaign website, FastAction and Action Profiles utilize the network effect of the large NGP VAN client-base, and can be used on any NGP VAN client form (such as petitions or volunteer signs). FastAction links in email sent through NGP VAN have a 100% conversion rate, because clicking on the link actually makes the contribution. “Our Democratic client network benefits from there being over 9 million profiles – because that means many potential supporters can contribute, without the boring work of having to fill out an entire online contribution form,” said NGP VAN CEO Stu Trevelyan. NGP VAN’s online contribution tools are the most popularly used by Democratic campaigns, in part because of partner packages like EmilysPluggedIn.com for pro-choice Democratic women candidates, DLCCGo.com for state legislative candidates, DMO-Go.com for municipal candidates, and DCCC1.org for U.S. House candidates. Republicans have lagged in rolling out similar features and taking advantage of a network effect, partially because they have been slower to develop such features, and partially because they lack a company with the same network as NGP VAN has amongst Democrats. Targeted Victory is the only company serving Republicans that has a single-click feature. Targeted Victory rolled it out to one beta client, the NRSC, a few months ago: it was panned as insecure by the Washington Post, and has only been adopted by a few other customers to date. As noted above, NGP VAN’s exclusive analysis of House candidates shows that the number of online contributions has increased by 34%. That rise in online contributions is a clear indicator that Democrats are succeeding in increasing the size of their low dollar online fundraising base. Meanwhile, offline fundraising hasn’t kept pace with the rapid growth in online fundraising; dollars contributed offline have increased by only 2.5% between the 2012 and 2014 cycles (and the number of offline contributions has actually decreased by 7.4%). Online fundraising has also begun playing a larger role in how Democratic campaigns are funded, significantly outpacing the growth seen in other parts of the non-profit sector. Democratic U.S. House candidates raised an average of 17.4% of their funds online, while other non-profits raised an average of 6.4% of overall giving in 2013. That 17.4% is up from 13.9% in 2012, while the rest of the non-profit sector saw a decrease in online giving as a percentage of overall giving - falling from 7% in 2012 to 6.4% in 2013. And while non-profit online giving has increased 25.6% along with overall giving to non-profits over the last two years, Democratic candidates increased their online fundraising at a much larger 34% over the same time period. The analysis looked at House candidates (who are up for election every two years, unlike all Senate, and many statewide/state legislative/local candidates). NGP VAN identified 94 Democratic House candidates running in both 2012 and 2014, and which used NGP VAN as their primary online fundraising web page in both cycles. NGP looked at the online and offline fundraising for the periods of 1/1/11-3/31/12 and 1/1/13-3/31/14. Join thousands of subscribers and receive great progressive tech reads each week. The Author: Divya Kunapuli is the Director of Marketing at NGP VAN. When she's not busy fighting the good fight, she's tweeting her latest thoughts on technology at @dkunapuli. Our products power the biggest campaigns in the world. Let us help you win.